This Sculptural Diamond Heart Necklace is accented with a single 1.5mm diamond and is an elegant way to wear your heart. It is about a half inch tall. ACCENTS: Around 1/20tcw. They can be Diamond, Gemstone, or CZ. 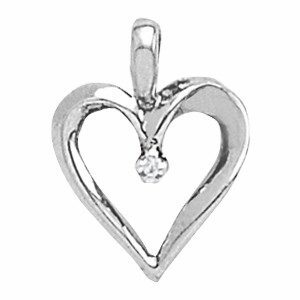 The starting price is for a Diamond Heart Necklace in 14K gold with I1, HI color diamond. Contact us for alternative pricing options. Click HERE to see another Sculptural Diamond Heart Necklace or contact us with your idea for a custom diamond necklace.